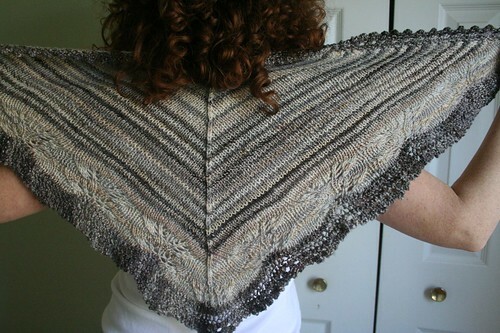 knitted :: handspun Andrea’s Shawl, originally uploaded by earthchick. Ta da! Two blogs posts in two days! And also: Ta da! My favorite knitted item so far this year! I could not love this more. I am SO THRILLED with how it turned out. whoops! edited to add: I did do a very small mod. I was concerned about running out of the Night fiber, so I ended up doing fewer dark stripes than the pattern calls for. Good thing, too. I have about 3 inches of yarn left after bind-off! verdict: BIG LOVE. Spinning the fiber was a dream, knitting with it was equally so. The drape is just delicious and the colors are divine. And of course the pattern is brilliant. 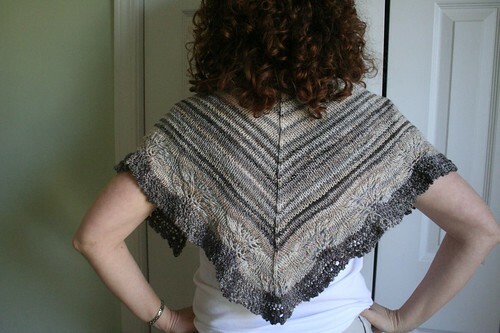 I loved how once I knit these two together, there ended up being a nice greyish/lavenderish look to the whole shawl, something I did not predict. 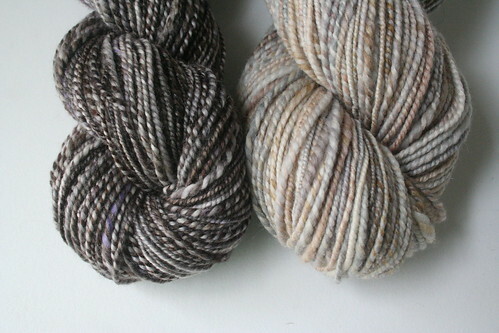 FLUFF is one of my favorite indie dyers, and the Silky Cashmerino is an amazing blend. The drape is just fantastic. Yes, I know I can’t quit talking about the drape. But y’all, it’s just so great. I would highly recommend this pattern. The construction is so clever, and the edging is just so sweet. 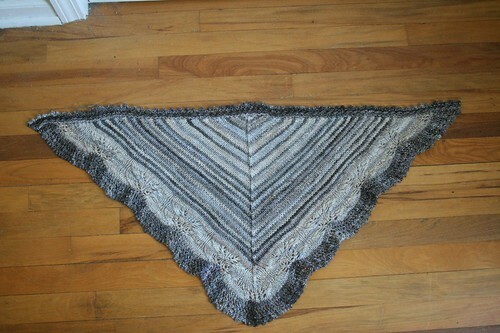 It’s a great use of handspun, in my opinion. I pretty much totally love it, y’all. Gorgeous!! 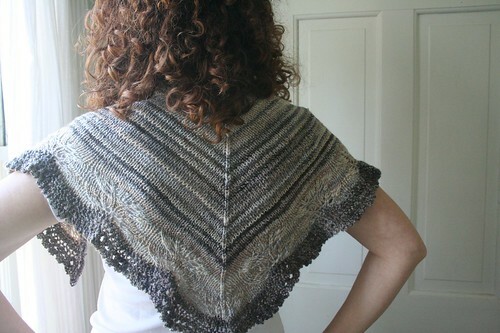 Your handspun is perfect for this pattern. I can totally see why this is your favorite item. Yum! That’s so pretty! Your yarn was perfect for it! Beautiful, Stace! Makes me want to get back to my crocheting! 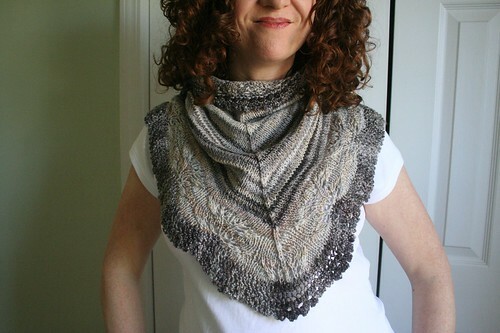 Wow – I’ll say – what a great combination of yarn and pattern!! I gotta go look up the pattern on Ravelry now. Really beautiful! 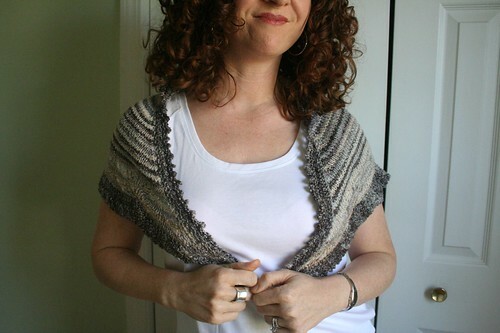 I love how you combined the two yarns. Wow! It’s gorgeous! I love the color combination! That looks so soft and lovely for wearing around one’s neck! Beautiful! The handspuns work so well together. Beautiful! I have to agree on the way the yarn “changed” colors once knit up… I’d scanned down quickly (so many posts! I wanted to see if I’d missed more!). My first thought was, “oh an FO and some new yarn she got.” It really does have an interesting effect knit up. A stunning one, actually. Has me mentally going through the small bit of handspun I have, wondering if I have enough to make one of my own! That came out absolutely beautiful! I am here from a link on Kirsten’s website and I can see why she wanted us to see it! I do not spin and this almost makes me wish I did! Great job! Love the colors, the design, I could go on and on….